The G7 comes at a time when LG is arguably less relevant than ever in the high-end smartphone space. 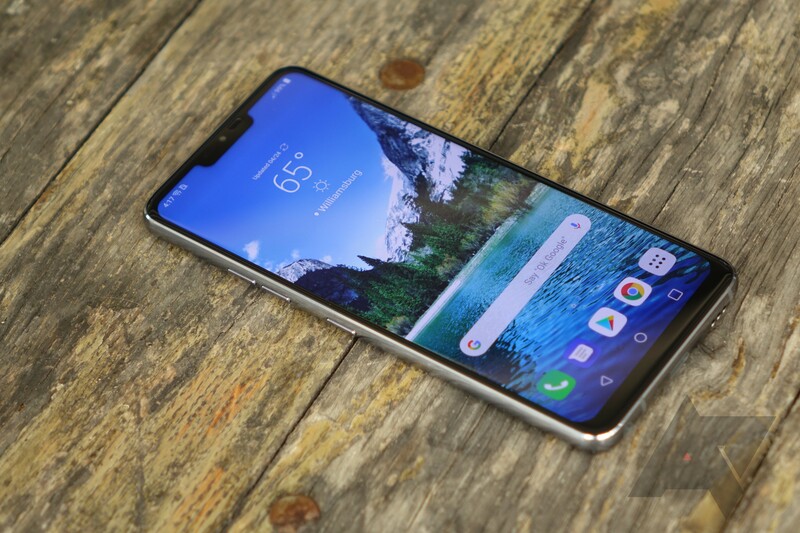 The V30 seems to have fallen on deaf ears with consumers (so deaf that LG launched it a second time), while the G6 was forced to use an inferior processor, a handicap that wasn't offset by more competitive pricing. Things generally aren't looking great for LG's mobile unit - which has been losing money for years - and it hasn't done a lot to positively differentiate its products from its arch-rival, Samsung, whose phones seem ever-more technically advanced by comparison. After spending some time with the G7, while it does come with all the notchy hotness Samsung's phones lack, I believe it offers precious little to set it apart from competitors. 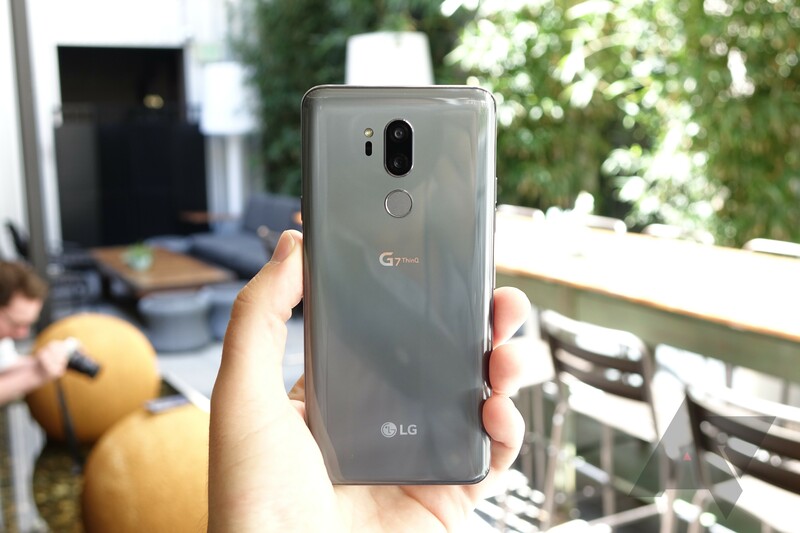 In short: anyone expecting that LG was going to radically change its smartphone strategy with the G7 will be sorely disappointed - this is absolutely more of the same. A display notch and some lip service to AI keep LG On TrendTM, but they don't make this phone meaningfully better. The 6.1" wide aspect ratio LCD does get very bright (LG says 1000 nits, but only in direct sunlight), which is good - a bright screen is a big help outdoors. But on the prototypes we were shown, I noticed light bleed along the notch area of the display. Given how many years LG phones have suffered from quality control issues like this, it's sad they still can't seem to get this consistently right. Maybe retail units will be better, or maybe my tester was uniquely flawed, but having seen this on LG's LCD displays for years now, I'm not holding my breath. Colors did look very nice, but without a good point of comparison in hand (which my Pixel 2 XL is... not), it's really hard to assess the display closely just yet. Wait for that in our full review. The G7 is powered by a Snapdragon 845, and here in the US will only be available in a 4GB RAM configuration with 64GB of storage (plus microSD slot). A 6GB/128GB version will be available in other, unspecified international markets. LG declined to elaborate on particular modem features being supported, another point of comparison that would be helpful when gauging against the Galaxy S9, which has a fully-loaded gigabit LTE setup with all the bells and whistles. As to battery life, LG wasn't making any promises, but a 3000mAh battery coupled with a 6.1" LCD (that has an always-on mode, to boot) doesn't have me feeling especially confident. 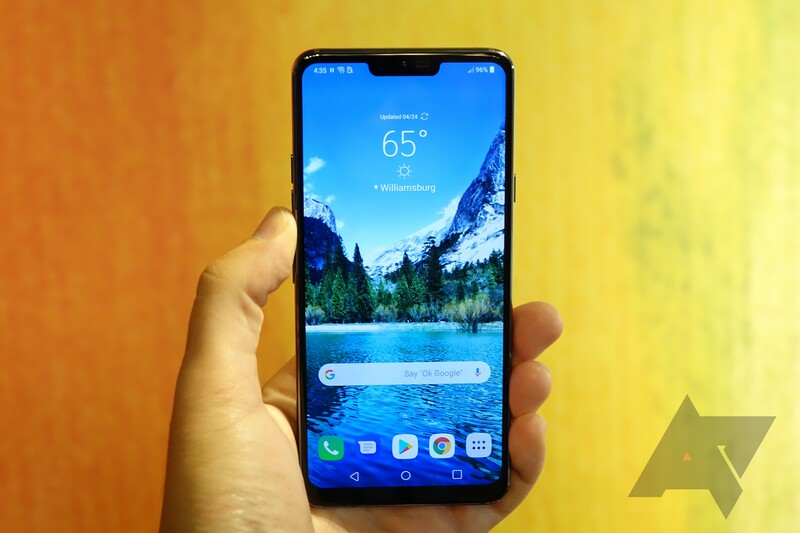 It's possible LG has done what Samsung couldn't and built a phone that actually makes good on the Snapdragon 845's claimed efficiency improvements, but that's a 10% (300mAh) capacity shrink even from the substantially smaller G6. And, like the G6, the new G supports wireless charging. The G7 is IP68 certified for dust and water protection, a feature that comes into play with a new-and-improved speaker design. LG says the fact that the phone is fully sealed means the "boombox" speaker can use the entire internal space as one big resonance chamber. 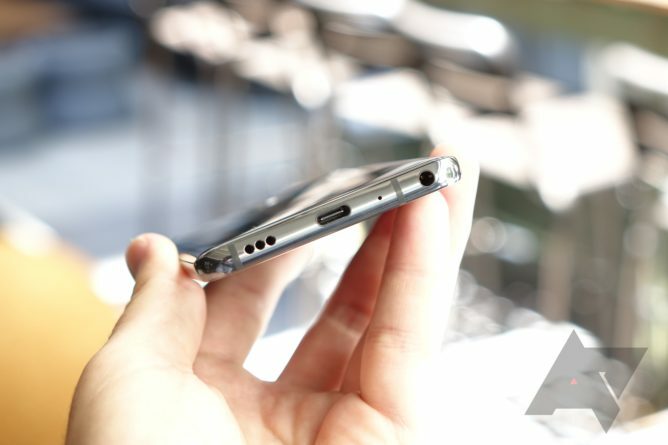 The speaker itself is also 39% larger than the one in last year's phone. The result? Actual bass. It's pretty cool, really - you can feel the entire phone vibrate when low frequencies play, and it could make the G7 a great device for consuming media. Couple that with the headphone jack powered by an ESS Sabre Quad DAC (audiophiles will be happy to hear), and the G7 does have some sound credentials. Also making a return from the V30 is that wonderful haptic feedback engine. It's even better than the one on Google's Pixel 2 XL, though it's still not really close to what you get on the iPhone X, in my experience. Regardless, it's the best vibration motor on any Android phone, and that's certainly something. The software is based on Android 8.0, and it's typical LG with typical LG changes, which is to say primarily theming and some added options in the settings area. 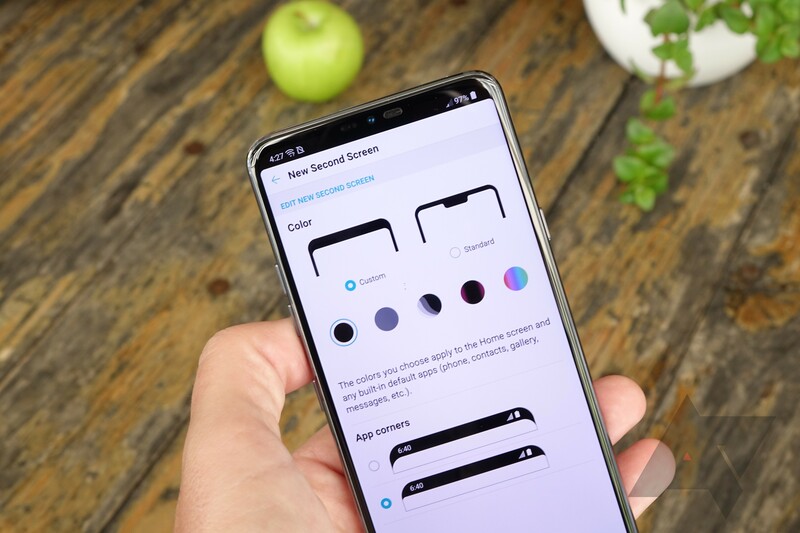 I didn't have a lot of time to really dig in here, but I did take a look at the settings for the display notch, which allow you to black out the notch area instead of fill it in with the background. It doesn't disable the notch - it just makes it look like a black status bar. I cannot for the life of me understand why anyone would want that option other than for the sake of saying "this isn't an iPhone," but it's there. Finally, the G7 has a dedicated Google Assistant button on the left-hand side of the phone, clearly in response to Samsung's Bixby key. It's not programmable (LG says if there is a lot of demand, this could change in a software update down the road). Oh, and there's a power button on the right - LG has abandoned the rear button scheme entirely, so the fingerprint scanner is now just a fingerprint scanner, and it's well-placed and easy to reach. LG wasn't really keen on touting the G7's imaging performance so much as it was its new ThinQ AI features, showcasing the phone's ability to identify certain kinds of objects and then optimize image capture settings and processing appropriately. This is something that's pretty hard to test, let alone in an hour, so I'll leave the conclusions for the review. My instinct? It feels like a gimmick, just as it did on the V30 ThinQ. If your camera is taking better photos because AI is figuring out what the subject matter is, why even expose that the AI bit is happening at all (let alone make it a separate shooting mode)? Just let the photos do the talking. 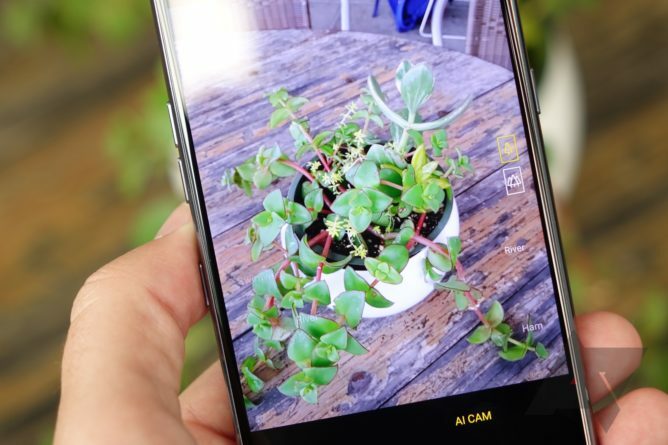 As with Huawei's image recognition AI, I feel this is far more about marketing the fact that the phone "has AI" through a visual interface element than it is actually improving the user experience. The fact that the phone understands it's looking at a piece of fruit is only helpful if that's actually resulting in a demonstrably better picture. I have the strong suspicion this feature is mostly technological window dressing (the underlying tech is licensed from another company, by the way) coupled with aggressive post-processing filters. The AI Cam shooting mode randomly displays "recognized" objects as text when it's searching the viewfinder. The results are often hilarious(ly terrible). The rear cameras otherwise appear unchanged from the V30 and V30S, both being 16MP, with one offering a wide 107-degree field of view. What is new is a portrait or bokeh mode that utilizes the wide angle lens to generate a grayscale depth map for a depth-of-field effect that can be shown in real time on the viewfinder, as well as adjusted after the fact (similar to Samsung's Note8 and S9+). There's a new 8MP front-facing camera, too, with an aperture of f/1.9 and a 95-degree field of view. 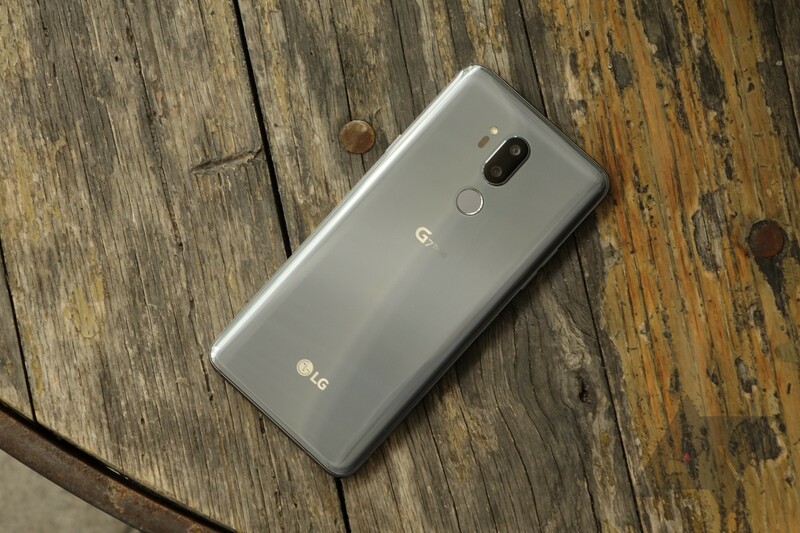 The G7 is exactly the phone you'd expect LG to build as a follow-up on the G6, and I just don't see that being what LG needs right now. LG's mobile leadership has embraced a strategy of blindly copying its most successful rivals. Paying lip service to AI - which is all this ThinQ nonsense really is - isn't helping LG with the perception that its smartphone division is struggling to innovate. In fact, the G7 makes it clear to me that LG's mobile leadership has embraced a strategy of blindly copying its most successful rivals. Huawei has AI in the camera, so now LG does, too. Samsung has a smart assistant button, so LG's added one. The iPhone X has a notch and, therefore, so too must the new LG phone. The problem is that LG isn't copying these things for any particularly good reason or even improving on them in the process (the notch, for example, is clearly worse) - it's copying them because it can. And it reeks of desperation. Though features like the badly-named but genuinely good "boombox" speaker and excellent haptic feedback are certainly nice, they're not enough on their own to make this phone stand out. The unvarnished truth is that if someone were to ask me if there were a reason they should consider the G7 as their next smartphone, I would have to say "no." Samsung's phones offer better cameras and displays, much more refined industrial design, useful features like Samsung Pay, and enjoy far larger ecosystems of first and third-party accessories. And with the Galaxy S9 and S9+ already heavily discounted due to slow sales, it's very difficult to see the G7 winning on value, either. LG increasingly feels like a bit player in the high-end smartphone game, and while the G7 doesn't seem like a bad phone, it really does seem like one that will be safe for most consumers to ignore.